1. So long as all fees are paid up to date, Storer: (a) is licensed to store Goods in the Room allocated to Storer by Robinsons self-storage from time to time and only in that Room; (b) is deemed to have knowledge of the Goods in the Room; and (c) warrants that it is the owner of the Goods in the Room and/or entitled at law to deal with them in accordance with all aspects of this Agreement as agent for the owner. 2. Robinsons self-storage: (a) does not have and will not be deemed to have knowledge of the Goods; (b) is not a Bailee or a custodian nor a warehouseman of the Goods and Storer acknowledges that Robinsons self-storage does not take possession of the Goods; and (c) does not grant any lease or tenancy of the Room. 4. Storer is responsible to pay: (a) the Storage Fee (being the amount set out in the cover sheet or as most recently notified to Storer by Robinsons self-storage) payable in advance on the first day of each storage period (Due Date) and it is Storer’s responsibility to see that payment is made directly to Robinsons self-storage on time and in full throughout the period of storage. Robinsons self-storage does not normally bill for fees. Any Storage Fees paid by direct transfer will not be credited to Storer’s account unless the Storer identifies the payment clearly and as directed by Robinsons self-storage and Robinsons self-storage shall have no liability to and shall be indemnified by Storer if Robinsons self-storage takes steps to enforce the Agreement (including the sale of Goods) due to the Storer’s failure to identify a payment. Robinsons self-storage will not accept that payment has been made until it has received cleared funds and, if any payment is later dishonoured, may charge the Cheque Return Fee; (b) the Cleaning Fee or charges for repairs, to be invoiced at FO’s discretion as per clause 19; (c) a Late Payment Fee each time a payment is late; (d) any costs incurred by the Robinsons self-storage in collecting late or unpaid Storage Fees, or in enforcing this Agreement in any way, including but not limited to postal, telephone, Room inventory, debt collection, personnel and/or default action costs and associated legal and professional fees; and (e) any government taxes or charges (including any value added tax) levied on any supplies made under this Agreement. Where Storer has more than one agreement with Robinsons self-storage, all will form one account with Robinsons self-storage and Robinsons self-storage may in its sole discretion elect to apply any payment made by or on behalf of Storer on this agreement against the oldest Debt due from Storer to Robinsons self-storage on any agreement in the account. 5. Robinsons self-storage takes the issue of prompt payment very seriously and has a right of lien. Regardless of Condition 35, if any sum owing to Robinsons self-storage is not paid when due, Storer authorises Robinsons self-storage without further notice to: (a) refuse Storer and its agents access to the Goods, the Room and the Facility and overlock the Room until the amount due and other fees related to it (Debt) have been paid in full; (b) enter the Room and inspect and/or remove the Goods to another Room or site and to charge Storer for all reasonable costs of doing so on any number of occasions; and (c) apply the Deposit against the Debt and, if insufficient to clear it in full, hold onto and/or ultimately sell or dispose of some or all of the Goods in accordance with Condition 7. Storer acknowledges that (a) Robinsons self-storage shall be entitled to continue to charge for storage from the date the Debt becomes due until payment is made in full or the Goods are sold or disposed of; (b) Robinsons self-storage will sell the Goods as if Robinsons self-storage was the owner and will pass all rights of ownership in the Goods to the buyer; and (c) if Storer does not pay fees on the Due Date, the value of any discounts and special offers (including periods of free storage) which Storer has received will be payable by Storer in full. 6. On expiry or termination of this Agreement, if Storer fails to remove all Goods from the Room, Robinsons self-storage is authorised to treat the Goods as abandoned and may sell or dispose of all Goods by any means in accordance with Conditions 7 to 9. Storer is liable for Storage Fees for the period from abandonment to the sale or disposal of the Goods together with any costs of disposal (Debt). 7. Before Robinsons self-storage sells or disposes of the Goods, it will give Storer notice in writing directing Storer to pay (if Storer is in default) or collect the Goods (if they are deemed abandoned). This notice will be sent by registered or recorded delivery to the address last notified by Storer to Robinsons self-storage in writing or by email only if you have elected not to receive traditional mail. If no address within the UK has been provided, Robinsons self-storage will use any land or email address it holds for Storer and any ACP. If Storer fails to pay the Debt and/or collect the Goods (as appropriate) Robinsons self-storage will access your space and begin the process to sell or dispose of the Goods. Storer consents to and authorises the sale or disposal of all Goods without further notice regardless of their nature or value. Robinsons self-storage will sell the Goods for the best price reasonably available in the open market, taking into account the costs of sale. Robinsons self-storage may also require payment of default action costs, including any costs associated with accessing the Room and disposal or sale of the Goods, which shall be added to the Debt. 8. Sale proceeds will be applied first against the cost of removal and sale of Goods and second to pay the Debt. If sale proceeds do not discharge all of these costs and the Debt, Storer must pay Robinsons self-storage the balance within 7 days of a written demand from Robinsons self-storage. Robinsons self-storage may take action to recover the balance and any legal and administration costs incurred in doing so. If sale proceeds exceed the amount due from Storer, Robinsons self-storage will hold the balance for Storer but no interest will accrue on it. 10. Any items left unattended in common areas or outside the Storer’s Room at any time may at FO’s discretion be moved, sold or disposed of immediately with no liability to Robinsons self-storage. 11. Storer has the right to access the Room during Access Hours as posted by Robinsons self-storage and subject to the terms of this Agreement. Robinsons self-storage will try to provide advance warning of changes to Access Hours by notice at the Facility but reserves the right to change Access Hours temporarily to other reasonable times without giving prior notice. 12. Only Storer or others authorised or accompanied by Storer (its Agents) may access the Room. Storer is responsible for and liable to Robinsons self-storage and other users of the Facility for its own actions and those of its Agents. Robinsons self-storage may (but is not obliged to) require proof of identity from Storer or any other person at any time and, at FO’s sole discretion, may refuse access to any person who is unable to produce satisfactory proof. 13. Robinsons self-storage may refuse Storer access to the Room and/or the Facility where moneys are owing by Storer to Robinsons self-storage, whether or not a formal demand for payment has been made, or if Robinsons self-storage considers the safety or security of any person, Room or goods on or at the Facility has been threatened or may be put at risk. 14. Storer should not leave a key with or permit access to the Room to any person other than its own Agent who is responsible to Storer and subject to its control. If Storer does so, it does so at its own risk. 15. Storer authorises Robinsons self-storage and its agents and contractors to enter the Room in the following circumstances and to break the lock if reasonably necessary to gain entry: (a) on not less than 7 days’ notice to inspect or carry out repairs or alterations to the Room or any other part of the Facility; (b) without prior notice (but with notice as soon as practicable after the event) in the event of an emergency (including for repair or alteration) or to prevent injury or damage to persons or property; or if Robinsons self-storage believes the Room is being used to store prohibited goods or for a prohibited purpose; or if Robinsons self-storage is obliged to do so by law, by the Police, Fire Services, Trading Standards, HM Revenue & Customs, competent authority or by a Court Order; or to relocate the Goods or exercise FO’s lien or power of sale or disposal in accordance with this Agreement. 16. Storer will be solely responsible for providing a secure padlock for the Room and ensuring it is locked so as to be secure from unauthorised entry at all times when the Storer is not in the Room. Robinsons self-storage will not be responsible for locking any unlocked Room. Storer is not permitted to apply a padlock to the Room in FO’s overlocking position and Robinsons self-storage may have any such padlock forcefully cut off at Storer’s expense. Where applicable, Storer will secure the external gates and/or doors of the Facility. 17. Storer must not store (or allow any other person to store) any of the following in the Room: (a) food or perishable goods unless securely packed so they are protected from and do not attract vermin; (b) any living creatures; (c) combustible or flammable substances such as gas, paint, petrol, oil, cleaning solvents or compressed gases; (d) firearms, explosives, weapons or ammRoomion; (e) chemicals, radioactive materials, biological agents; toxic waste, asbestos or other potentially hazardous substances; (f) any item that emits fumes, or odours; (g) any illegal item or substances or goods illegally obtained such as illicit (counterfeit/smuggled) tobacco or alcohol and unlicensed or unsafe goods (such as toys, electrical goods, medicines, aerosols, cosmetics, fireworks); (h) goods which are environmentally harmful or that are a risk to the property of any person; (i) currency, deeds and securities; and (j) items which are irreplaceable by their unique nature or of significant value to the Storer due to personal sentimental reasons. Storer will be liable under Condition 28 for any breach of this Condition 17. 18. Storer will use the Room solely for the purpose of storage and shall not (or allow any other person to): (a) use the Room as offices or living accommodation or as a home, business or mailing address; (b) use or do anything at the Facility or in the Room which may be a nuisance to Robinsons self-storage or any other person (including the escape of any substance or odour from or generation of noise or vibration which may be heard or felt outside the Room); (c) use or do anything at the Facility or in the Room which may invalidate or increase premiums under any insurance policies of Robinsons self-storage or any other person; (d) paint or make alterations to or attach anything to the internal or external surfaces of the Room; (e) connect or provide any utilities or services to the Room unless authorised by Robinsons self-storage; or (f) cause damage to the Room or any part of the Facility (which includes by removal, haulage or delivery contractors) or create any obstruction or leave items or refuse in any common space within the Facility. 19. Storer must maintain the Room by ensuring it is clean and in a state of good repair. In the event of uncleanliness of or damage to the Room or Facility, Robinsons self-storage will be entitled to retain the Deposit, charge a Cleaning Fee, and/or claim full reimbursement from the Storer of the reasonable costs of repairs, replacement, restoration, proper compensation or disposal of refuse. 20. Storer must (and ensure that its Agents) use reasonable care on site and have respect for the Facility and other Room users, inform Robinsons self-storage of any damage or defect immediately it is discovered and comply with the reasonable directions of FO’s employees, agents and contractors and any other regulations for the use, safety and security of the Facility as Robinsons self-storage shall issue periodically. 21. This Agreement does not confer on Storer any right to exclusive possession of the Room and Robinsons self-storage reserves the right to relocate Storer to another Room not smaller than the current Room (a) by giving 14 days’ notice during which the Storer can elect to terminate their agreement under Condition 35 or (b) on shorter notice if an incident occurs that requires the Room or section where it is located to be closed or sealed off. 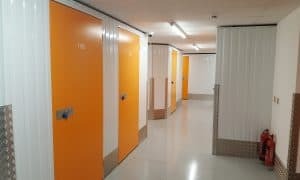 In these circumstances, Robinsons self-storage will pay Storer’s reasonable costs of removal if approved in writing by Robinsons self-storage in advance of removal. If Storer does not arrange removal by the date specified in FO’s notice, then Storer authorises Robinsons self-storage and its agents to enter Room acting as Storer’s agents and at Storer’s risk (except for damage caused wilfully or negligently which is subject to the limitations in Condition 26) remove the goods. Following removal this agreement will be varied by substitution of the new Room number but otherwise continues in full force and effect at the rate in force for the original Room at the time of the removal. 22. Storer must ensure the Room is suitable for the storage of the Goods intended to be stored in it and is advised to inspect the Room before storing Goods and periodically during the storage period. Robinsons self-storage makes no warranty or representation that any Room is suitable for any particular goods and accepts no liability in this regard. 23. Robinsons self-storage may refuse to permit Storer to store any Goods or require Storer to collect any Goods if in its opinion storage of such Goods creates a risk to the safety of any person or property. 24. Storer must give Notice to the Robinsons self-storage in writing of the change of address, phone numbers or email address of the Storer or the Alternate Contact Person (“ACP”) within 48 hours of any change. Storer agrees Robinsons self-storage is entitled to discuss any default by the Storer with the ACP registered on the front of this Agreement. 25. Robinsons self-storage will not be liable for any loss or damages suffered by Storer resulting from an inability to access the Facility or the Room, regardless of the cause. 26. The Goods are stored at the sole risk and responsibility of Storer who shall be responsible for and bear the risk of any and all theft, damage to, and deterioration of the Goods caused by any reason other than caused by our negligence or breach of contract. Robinsons self-storage excludes all liability in respect of loss or damage to (a) Storer’s business, if any, including consequential loss, lost profits or business interruption; and (b) Goods above the sum of £100 in total per incident, which Robinsons self-storage considers to be the normal excess on a standard household policy whether or not that policy would cover the Goods. Robinsons self-storage does not exclude liability for physical injury to or the death of any person and which is a direct result of negligence or wilful default on the part of Robinsons self-storage, its agents and/or employees. 27. Robinsons self-storage does not insure the Goods and it is a condition of this Agreement that the Goods remain adequately insured at all times for their Replacement Value (as set out on the cover sheet) while they are in storage. Storer warrants that such cover is in place, that it will not allow or cause such cover to lapse and that the aggregate value of Goods in the Room from time to time will not exceed the Replacement Value. Robinsons self-storage does not give any advice concerning insurance cover given by any policy and Storer must make its own judgment as to adequacy of cover even when facilitated by the Robinsons self-storage. Inspection of any insurance documents provided by Storer to demonstrate cover does not mean Robinsons self-storage has approved the cover or confirmed it is sufficient. 28. Storer will be liable for and compensate Robinsons self-storage for the full amount of all claims, liabilities, demands, damages, costs and expenses (including any reasonably incurred legal and professional fees) incurred by Robinsons self-storage or third parties (Liabilities) resulting from or incidental to (a) the use of the Room (including but not limited to the ownership or storage of Goods in the Room, the Goods themselves and/or accessing the Facility) or (b) breach of this Agreement by Storer or any of its Agents or (c) enforcement of any of the terms of this Agreement. 29. Storer acknowledges and agrees to comply with this Agreement and all relevant laws and regulations as are or may be applicable to the use of the Room. This includes laws relating to the material which is stored and the manner in which it is stored. Liability for any and all breach of such laws rests absolutely with Storer, and includes any and all Liabilities resulting from such a breach. 30. If Robinsons self-storage has reason to believe that Storer is not complying with all relevant laws Robinsons self-storage may take any action it believes to be necessary, including but not limited to the action outlined in Conditions 15 and 35, contacting, cooperating with and/or submitting Goods to the relevant authorities, and/or immediately disposing of or removing the Goods at Storer’s expense. Storer agrees that Robinsons self-storage may take such action at any time even though Robinsons self-storage could have acted earlier. 31. In respect of circumstances outside FO’s reasonable control, Robinsons self-storage shall have no liability under or be considered to be in breach of this Agreement for any delay or failure in performance of its obligations under this Agreement or any resulting loss or damage to Goods. Such circumstances include any Act of God, riot, strike or lock-out, trade dispute or labour disturbance, accident, breakdown of plant or machinery, fire, flood, shortage of labour, materials or transport, electrical power failures, threat of or actual terrorism or environmental or health emergency or hazard, or entry into any Room including the Room or the Facility by, or arrest or seizure or confiscation of Goods by, competent authorities. If this happens, Robinsons self-storage will not be responsible for failing to allow access to the Goods, Room and/or the Facility for so long as the circumstances continue. Robinsons self-storage will try to minimise any effects arising from such circumstances. 32. Robinsons self-storage collects information about Storer on registration and whilst this Agreement continues, including personal data (Data). Robinsons self-storage processes Data in accordance with the General Data Protection Regulation and all associated laws. Robinsons self-storage uses Data to process payments, communicate with Storer and generally maintain Storer’s account, to comply with its legal obligations and for its legitimate business interests. Robinsons self-storage may share Data with, and collect Data from, credit reference or fraud prevention agencies and trade associations of which Robinsons self-storage is a member. If Storer does not pay Fees when due, Robinsons self-storage may share Data with debt collection agents. If Storer applies for FO’s insurance, Robinsons self-storage will pass Data on to the insurer, who may enter such Data onto a register of claims shared with other insurers to prevent fraudulent claims. Robinsons self-storage will release Data and other account details at any time if it considers in its sole discretion this is appropriate: (a) to comply with the law; (b) to enforce this Agreement; (c) for fraud protection and credit risk reduction; (d) for crime prevention or detection purposes; (e) to protect the safety of any person at the Facility, (f) if Robinsons self-storage considers the security of any unit at the Facility or its contents may otherwise be put at risk. Also, if Robinsons self-storage sells or buys any business or assets, it may disclose Data and account details to the prospective seller or buyer of such business or assets or if substantially all of FO’s assets are acquired by a third party, Data and account details will be one of the transferred assets. Individuals have the right to request a copy of the information that Robinsons self-storage holds on them, to request that inaccurate Data is rectified, to restrict how Data is used and in certain circumstances to have Data deleted. Requests for any of these should be emailed or sent to the addresses on the cover sheet, to be passed on to our Data Compliance Manager. More details on how Robinsons self-storage uses Data and Storer’s rights in relation to Data are set out in FO’s Privacy Notice which can be viewed on its website or provided on request. 33. If Storer gives consent, Robinsons self-storage will use Data for marketing purposes, including to provide Storer with information on products or services provided by Robinsons self-storage in response to requests from Storer or if Robinsons self-storage believes they may be of interest. Storer’s choice with regard to the relevant use of Data is indicated in the cover sheet and can be changed at any time by Storer contacting Robinsons self-storage. 34. Notices to be given by Robinsons self-storage or Storer must be in writing and must either be delivered by hand or sent by pre-paid post. Robinsons self-storage may also give Notice to Storer by SMS or email if Storer has elected to receive correspondence this way. Notices shall be deemed received at the time of delivery by hand, one hour after sending by email or SMS or 48 hours after posting. Notices from Robinsons self-storage to Storer will be sent to the address on the cover sheet or the most recent address in England notified to Robinsons self-storage. In the event of not being able to contact the Storer at the last notified address or other contact including SMS or email, Notice is deemed to have been given to Storer if Robinsons self-storage serves that Notice on the ACP as identified on the front of this Agreement at the last notified address or other contact including SMS or email of the ACP. Any notice from Storer must be sent to the Robinsons self-storage at the address on the cover sheet. In the event that there is more than one Storer, Notice to or by any singleStorer is agreed to be sufficient for the purposes of any Notice requirement under this Agreement. 35. Either party may terminate this Agreement by giving the other party Notice of the Termination Date in accordance with period indicated on the cover sheet ending on any Due Date. In the event of illegal or environmentally harmful activities on the part of the Storer or a breach of this Agreement (which, if it can be put right, Storer has failed to put right within 14 days of notice from Robinsons self-storage to do so), Robinsons self-storage may terminate the Agreement immediately by Notice. Robinsons self-storage is entitled to retain from the Deposit, or make a charge for, apportioned Storage Fees if less than the requisite Notice is given by Storer. Storer must remove all Goods in the Room before the close of business on the Termination Date and leave the Room in a clean condition and in a good state of repair to the satisfaction of the Robinsons self-storage. In the event that Goods and/or refuse are left in the Room after the Termination Date, Conditions 6 and 19 will apply. 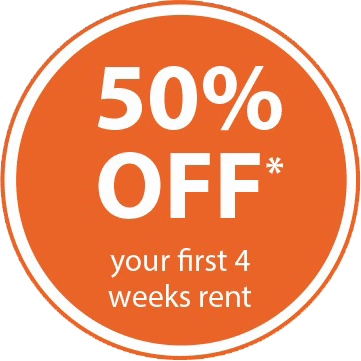 Storer must pay any outstanding Storage Fees and any expenses on default or any other moneys owed to Robinsons self-storage up to the Termination Date, or Conditions 5 to 9 may apply. Any calculation of the outstanding fees will be by Robinsons self-storage. If Robinsons self-storage enters the Room for any reason and there are no Goods stored in it, Robinsons self-storage may terminate the Agreement without giving prior Notice but will send Notice to Storer within 7 days. 36. Storer agrees to examine the Goods carefully on removal from the Room and must notify Robinsons self-storage of any loss or damage to the Goods as soon as is reasonably possible after doing so. 38. Robinsons self-storage may vary the Storage Fee or other terms of this Agreement and add new terms and conditions as long as such modifications are notified to Storer in writing. The modified terms will take effect on the first Due Date occurring not less than 28 days after the date of FO’s notice. Storer may terminate without charge before the change takes effect by giving notice in accordance with Condition 35. Otherwise, Storer’s continued use of the Room will be considered as acceptance of and agreement to the amended terms. 39. Storer acknowledges and agrees that: (a) the terms of this document constitute the whole contract with Robinsons self-storage and, in entering this contract, Storer relies upon no representations, oral or otherwise, other than those contained in this Agreement; (b) it has raised all queries relevant to its decision to enter this Agreement with Robinsons self-storage and Robinsons self-storage has, prior to the Storer entering into this Agreement, answered all such queries to the satisfaction of Storer; (c) any matters resulting from such queries have, to the extent required by Storer and agreed to by Robinsons self-storage, been reduced to writing and incorporated into the terms of this Agreement; (d) if Robinsons self-storage decides not to exercise or enforce any right that it has against Storer at a particular time, then this does not prevent Robinsons self-storage from later deciding to exercise or enforce that right unless Robinsons self-storage tells Storer in writing that Robinsons self-storage has waived or given up its ability to do so; (e) it is not intended that anyone other than Storer and Robinsons self-storage will have any rights under this Agreement and accordingly the Contracts (Rights of Third Parties) Act 1999 shall not apply to it; (f) if any court or competent authority decides that any of the provisions in this Agreement are invalid, unlawful or unenforceable to any extent, the provision will, to that extent only, be severed from the remaining terms, which will continue to be valid to the fullest extent permitted by law; (g) Storer may not assign or transfer any of its rights under this Agreement or part with possession of the Room or Goods whilst they are in the Facility; and (h) where Storer consists of two or more persons each person takes on the obligations under this Agreement separately.